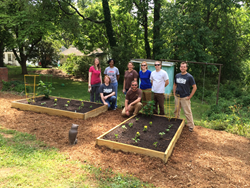 Carolina Farm Credit volunteers construct raised bed gardens at local children's home. Volunteers from Carolina Farm Credit spent time constructing and planting raised bed gardens at the Children’s Home of Iredell County. The Children’s Home of Iredell County is located at 487 North Center Street Statesville, NC. The community project was organized by Jennifer Minton, a Loan Officer from Carolina Farm Credit’s Statesville Branch, and other employee volunteers included: Sarah Rachels, Johnathan Almond and Scott Robinson of the administrative office; Wanda Harris from the Rural Hal Branch, Donna Dent from the Graham Branch, Ben Cabaniss from Lincolnton, and Maegan Williams from Asheboro. The Farm Credit team used its time to turn an unused part of the back yard into a raised bed garden that will not only supply the children’s home with fresh vegetables, but the opportunity for the children to learn about agriculture and the foods that they eat. “Carolina Farm Credit has remained committed to promoting and preserving rural America and the communities we serve, and this was just one example of how a group of people coming together can make a great impact in the community,” said Sarah Rachels, Human Resources Manager Carolina Farm Credit. Carolina Farm Credit is a stockholder-owned cooperative providing financing to full and part-time farmers and agricultural-related businesses and also provides financing for the construction and purchase of homes in 54 counties through 36 branch offices. Other financial services available are credit life insurance, crop insurance, appraisal services, leasing programs and financial planning. Carolina Farm Credit serves over 9,200 members with loans outstanding totaling more than $1.4 billion. The association’s territory covers the western half of North Carolina, with branch offices located in Albemarle, Asheboro, Asheville, Boone, Browns Summit, Burnsville, Carthage, Concord, Conover, Ellerbe, Graham, Hendersonville, Hillsborough, Jefferson, Lenoir, Lexington, Lincolnton, Marshall, Mocksville, Monroe, Murphy, Pilot Mountain, Roxboro, Rural Hall, Salisbury, Shelby, Siler City, Sparta, Spindale, Statesville, Taylorsville, Wadesboro, Waynesville, Wilkesboro, Yadkinville, and Yanceyville. Carolina Farm Credit was recognized as a 2015 Best Employer in North Carolina. The list of the Best Employers in North Carolina was created by Business North Carolina, the Society for Human Resource Management (SHRM) – NC State Council and Best Companies Group. Directors for Carolina Farm Credit are Mark A. Bray, Chairman, Lawsonville; L. Kim Starnes, Vice-Chairman, Salisbury; John M. Barnard, Statesville; E. Bernard Beck, Seagrove; W. Rex Bell, Statesville; David M. Coltrane, Pleasant Garden; Susie J. Gambill, Sparta; Joseph A. Lail, Shelby; Clark M. Newlin, Haw River; Thomas E. Porter, Jr., Concord; Tony L. Ragan, Sanford; D. Kaleb Rathbone, Waynesville; Lewis E. Smith, Lincolnton; Vickie N. Smitherman, East Bend; Dr. Alton Thompson, Summerfield.